Dedicated to holding men responsible for their actions, behaviors and role in society. Using non-violent peer pressure to stop unhealthy behaviors among men that negatively impacts them, their family, the community and society. 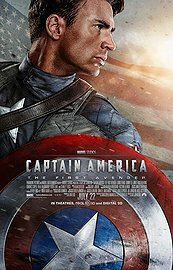 One of the sleeper hits at the movie box office this summer is Captain America: The First Avenger. According to the Wall Street Journal as of August 8th it has grossed $143.2 million, beating out Speilburg's Cowboys and Aliens by a margin of over 2 to 1. I went to see Captain America and, being the skeptic, was waiting for Hollywood to turn him into some kind of multiculturalist world view crime fighter who falls into the depths of psychosis much like Batman in The Dark Knight. I was pleasantly surprised after seeing the movie that Captain America was all American. If you have not seen this film I encourage you to do so and take your children with you. The story line is set in WWII. Steve Rogers is a young man who will do anything to serve his country. Initially he is not the super hero but rather the super patriot. With the body of a less than ordinary man he is repeatedly rejected for military service. Finally, he is selected to be part of a scientific experiment. The character development of Steve Rogers (a.k.a. Captain America) is exceptional. His courage and fortitude is tested by those who reject him for military service and those who pick on him for his less than adequate physical attributes. He remains strong in spirit and never gives in. During one scene those trying out for the honor of becoming the scientific guinea pig are challenged to climb a flag pole to take down the banner at the top. Many have tried to climb it, all have failed. Steve, rather than climbing the flag pole, pulls out the lynch pin holding it up and when the poll drops to the ground he casually takes off the banner. The perfect brains over brawn analogy. The most important part of Captain America for me was why he was picked. In the movie Steve Rogers asks Dr. Abraham Erskine, the head of the scientific team: "Why me?" Dr. Erskine replies, "...because a weak man knows the value of strength, the value of power..." With this one quote, Dr. Erskine explains to the doubting Steve that because he was once weak, he understands the responsibilities that come with great strength. This strikes a cord in all Americans and represents where we were prior to WWII. We were a weak nation that understood its responsibilities. We entered WWII to in fact save the world from National Socialism, Imperial Japan and Fascist Italy. We as a nation understood our responsibilities. Now, for the Colt 45. Captain America of course carries the U.S. made Colt 45. The Colt 45 is considered the greatest automatic hand gun ever made. This year marks the 100th anniversary of the original M1911 Colt 45. The history of the Colt 45 parallels the history of America's greatness. It was the hand gun that helped win in WWII. I carried the Colt 45 as an officer for 23 years. I qualified as an Expert marksman with it while in service. Like Marvel's Captain America the Colt 45 is a legend. I end with this exchange between the villain in the film and Steve. Red Skull, "What makes you so special?" Steve Rogers (Captain America), "Nothing. I'm just a kid from Brooklyn." This is who won WWII. Ordinary men and women doing extraordinary things. America was the last final hope and she came through. I look forward to the sequel to Captain America. We need him more now than ever. I close with another quote by Dr. Erskine directed at Steve Rogers, "Whatever happens, stay who you are. Not just a soldier, but a good man." My thoughts and prayers go out to the families and orphaned children of the special operations forces soldiers who just died in Afghanistan. The were not just soldiers, they were good men. America's finest. “America is like a healthy body and its resistance is threefold: its patriotism, its morality and its spiritual life. If we can undermine these three areas, America will collapse from within.” - Joseph Stalin, U.S.S.R Premier. "We asked for freedom of the press, thought, and civil liberties in the past because we were in the opposition and needed these liberties to conquer. Now that we have conquered, there is no longer any need for such civil liberties." – Nikolai Bukarin, Communist Director of Industrial Development, U.S.S.R.